We all have our dessert traditions: those sweet treats that have been passed down the generations, shared from friends and family. Maybe its Mom’s Ice Box Sugar Cookies, rolled out with love and cut from Great-Great Grandma’s cutters. You know: the reindeer, Christmas tree, festive snowman, and star. Then decorated with lots of icing, silver balls, and sprinkles. Or boxes of homemade fudge wrapped in wax paper and delivered in that special holiday tin. How cool that these days you can just hop online and see what other’s sweet traditions are. Blogs, newsletters, Facebook pages, Pinterest, and Instagram – all bring us new and d’lish inspiration these days. It’s like having a recipe file at your fingertips! And there is something to be said of that. Mom’s tattered and stained recipe card, with hand-written notes has that special love on it that is sure to come through in the final dish. So it’s important that these holiday traditions be passed on. Here’s a link to my Mom’s Gumdrop Cookies that I grew up with! I like to preserve these well-worn recipes. Why not create a little digital book with your most cherished family and friends recipes to pass to those you love this holiday season. Who wants a slice of my Over 21 “Real Fruit” Cakes made with Maker’s Mark? 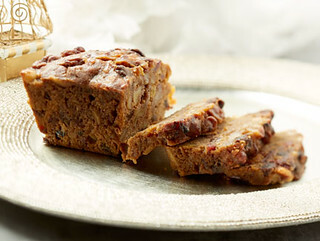 My Grandma always baked amazing fruitcake – I took her recipe and have now given it my own spin by soaking dried fruits in Maker’s Mark bourbon, then mixing it with spiced batter and lots of toasted nuts. You can get my Over 21 “Real Fruit” Cakes while supplies last (available online or at my Food Studios in Ballard). The holidays are coming up and for many of us that means some long flights. I fly a lot so I understand that it’s not always fun or d’lish, but I’ve got some tips to help with that. If you’re flying international on a long flight, definitely pack some food. Make sure to bring compact thing and nutritious items that won’t go bad. And don’t forget snacks for the kids that are not messy or smelly! Stay away from high sodium tomato juice and Bloody Mary’s (tempting as they can be) on long flights. Pack only items low in sodium and remember the “puffy factor” when you fly! And keep the coffee to a minimum too; it’s very dehydrating. Make sure to drink lots of water. I like to pack a lemon and a plastic disposable knife to add a slice or wedge to your water bottle. Then ask the flight attendant to fill it up for you or depending on specific airline regulations, order 2 glasses of water and fill it yourself. Dish D’Lish Mediterranean Quinoa Salad is my Favorite for Travel! Comfort foods, we all have our must-haves and go-tos. And luck has it that National Comfort Food Day is this weekend! We all have those favorites that stir up delicious memories and are well…comforting! For some, it’s fluffy mashed potatoes with a pool of delicious homemade gravy or Mom’s chicken noodle soup simmering on the stove. For others, it may be a favorite family dessert like grandma’s apple pie or dad’s buttermilk-soaked crispy fried chicken. 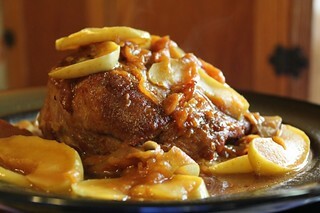 My husband John’s favorite comfort food is my Slow-Braised Pork Pot Roast with Apples & Onions – its delicious aroma filling the house on a lazy Sunday. Taste is one of our strongest memories. Things that we loved in our younger years become beloved comfort foods we crave. And it’s not just about childhood. One bite of, for example, pasta carbonara can bring you back to that restaurant in Rome when you were on your first trip to Italy. Around the holidays we all certainly have our comforting favorites, especially when it comes to the sides that cozy up to the turkey, holiday ham, or roast. Be it oyster stuffing, old-school green bean casserole or roasted Brussel sprouts. This photo is from another blog I really liked: Sister See Sister Do with a Pressure Cooker recipe that also looks delicious! This this juicy tender pork roast makes a super winter meal, especially when served with whipped potatoes and root veggies such as turnips, parsnips or rutabagas. Serve with lots of hearty bread to sop up all the delicious juices. Gala apples are used in this recipe for their superior, firm texture when cooking. If Gala apples are not available, try to find Fujis, which also work well. Gluten-Free Wish List-the perfect gift for those on your Nice List! 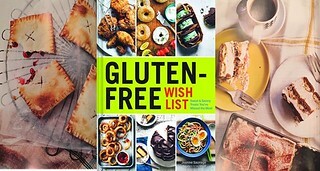 My dear friend, genius gluten-free guru Jeanne Sauvage, has released an inspiring new cookbook – the Gluten-Free Wish List, filled with delicious and craveable sweet and savory dishes for celiacs and the health conscious alike. Living a gluten-free lifestyle can sometimes lead to feeling like you’re missing out on your favorite comfort foods, but Jeanne, who is gluten-intolerant herself, refuses to let this notion dictate her life and her diet. Jeanne’s book will fulfill all your cravings! After much trial and error, she has built a delicious and diverse collection of recipes that even I, as a non-celiac, have been drooling over. From Challah to crispy Fried Chicken to chewy Bagels, Jeanne has managed to transform seemingly unattainable wheat staples into scrumptious celiac-friendly treats. Standout recipes include Potato Gnocchi with Tomato-Porcini Mushroom Sauce, Chicken and Dumpling Soup, Old-Fashioned Doughnuts, and her helpful and informative instructions for Laminated Doughs – hello Croissants! And if the idea of Pop Tarts brings back fond memories from your childhood, then check out her sophisticated and delightful take on Toaster Tarts. Personally, I can’t resist a good tiramisu and her version is as luscious and satisfying as any recipe out there. It’s safe to say that the recipes in Gluten-Free Wish List don’t just ‘taste good for gluten-free’, they taste d’lish period! Jeanne’s book is available locally in Seattle at Book Larder – stop on by to support Small Independent Book Stores.